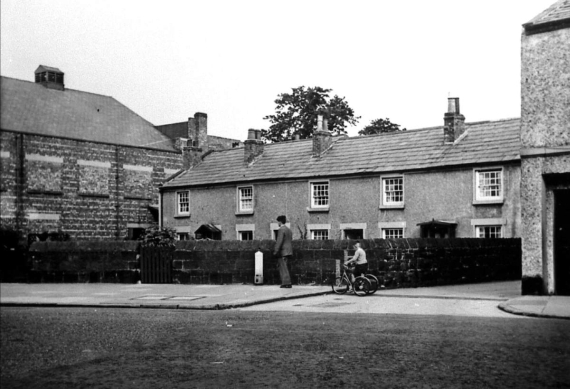 Thanks to Syd Bird for the above early 1960’s photo of the row of cottages on Market Street. For a comparison here’s the same view of the cottages taken this morning (not the most pleasant of mornings either). Notice the addition of the street lamp, road sign and flower beds. The roof on the lefthand building (formerly the Kingsway Cinema, currently a Home Bargains store) has gone. The righthand building were Hoose Court is was demolished. A couple of the cottages have lost chimney stacks. As a lad growing up in West Kirby & Hoylake there were 3 local cinemas, The Tudor, The Winter Gardens and The Kingsway, Where would a local lad have to go now to the local flicks, how far and how much to see an average session? I am the Charles Morris, as featured variously in this blog and who also wrote the booklet referred to. It was not actually published by Rose Publicity : they just had an advert in it.. I still have several copies of the booklet if anyone is interested, but as this year is the centenary of the opening of the Winter Gardens (nee Lighthouse Pavilion) it is my intention to re-write and hopefully re-publish the booklet as I have come by a considerable amount of additional information. Sorry about my confusion ref, Albert, by the way ! My late father, Monty Rose, formed Rose Publicity a few years after the war. He was a commercial artist who after being demobbed in 1945 became a salesman for Rank Screen Advertising. After he left Rank he started Rose Publicity a company that produced forth coming film review magazines. He drew the pictures and wrote articles showing and previewing the next months films. He then engaged with local businesses to effectively fund his projects. His first cinema was the Rex in Wilmslow. Later he had virtually evey cinema and chain in the UK, Including ABC, Cannon and Star chains as well as most of the independents. B and D print in leyland was formed by 2 brothers, Byron and Dennis, they did all the printing and distribution of the “Preview magazines” for my father, they are both still alive. Only a few months ago I spoke to Byron (a lovely chap) Im sure he will have copies of these lost treasures if you are interested together with other cinema preview magazines from across the country.. I am particularly interested in obtaining any copies of the preview magazines that B & D printed. My wife may not approve of my acquiring any more, but that’s another matter ! I have always collected these whenever I have been able. If you could put me in touch with them, or vice-versa, I would be very grateful. on 01772 435 050, he may be able to help you. I remember those cottages from my childhood when i lived in Hoylake. The display of dahlias in the Hardman’s garden was spectacular. I don’t remember which theirs was, but not either of the end cottages. Yes as Keith Wallen says- 3 cinemas and the programme changed twice a week. We lived close to the Winter Gardens and would hear the van delivering the film reels in metal containers early in the morning as they collected the old and left the new films. I also recall some stage shows at the Winter Gardens- and I think the Tudor. Not sure that there were ever stage shows at the Kingsway- but the “back row” was very popular!! I think you’ll find that Eric Bartholomew (later Eric Morecambe) won a talent contest at the “Kingsway” in 1939. I too remember the Dahlias in the cottage garden, more recently my husband lived in the cottage nearest to School Lane before he got married. What/where was the Winter Gardens ? The Winter Gardens was a cinema at promenade end of Alderley Road. I’m not sure whats on the site now as I no longer live in Hoylake. But back in the day it was a very popular cinema, particularly the Saturday kids matinee (tanner rush). Sorry, yes of course! I wasn’t aware that it was called the Winter Gardens. The building was demolished and replaced with an apartment block. The Winter Gardens included was built on the site of the Lower Lighthouse. The lighthouse was retained in the car park behind the Hoylake Sailing Club for many years, not sure when it went. Perhaps in the ’50s as I never saw it. The cinema was originally called the Lighthouse Pavillion I believe and part of the lightkeeper’s house was incorporated into the theatre / cinema building and could be seen quite clearly if you knew what you were looking for. I think it was a very simlar design to the Upper Light in Valentia Road. How many names did the cinema have over the years I wonder? Yes Nick, i think thats correct it was Hoylake Cannon for a while, then it closed down until a lady called Mrs. Mottram bought it so the public had a local ammenity left, i think she was from Caldy. I lived in the left end cottage. It’s address is 111 Market St. The size of the cottage was very diseptive. Looked very small from the front but the rooms were quite large for such an old cottage. The building is built from sandstone. A lit fire would warm the water up in the stone to add warmth throughout the night. The opposite happened in the summer as the water would be cooled at night and keep the house cool during the summer months. The cottage was known as ” Rose Cottage” because of the different cloured blooms in the fron garden. I do remember that when Tesco’s owned next door…their lorries would knock the back wall down trying to get to the back loading platform. On the site that was once the cinema is a now a block of flats called Sandpipers Court. The flats are very pleasant – though cool when it’s windy! Top flat used to be a great lookout on to the launching of the lifeboat which went out from the Lifeboat Station next door. I remember the lady who used to collect the money at the cinema – she also worked in the little kiosk at Hoylake Station. Ethel – I think that was her name. Do we, er…, take it they had Albert before they were married, as Albert was Marchbank and not Triggs ? you are understandably getting confused. Let me try to put this into perspective. Dolly as George says above (Hi George, hope all is well with you and Merle) married Julian Triggs on Christmas Day 1940, their son Albert Julian Triggs was born on 18th October 1941 so not born ‘out of wedlock’. The Albert you refer to was Dolly’s brother and therefore Albert Triggs’ uncle ( Albert Marchbank was well known for being the Funeral Director and had his business in Hoylake which was sold to the Co-operative after his death). I think there were three sisters – Annie (aka Nicky), Edna and Ethel. Annie worked at the cinema and taxi office, Edna worked at the baths and (for a few years) at the cinema, Ethel just worked at the taxi office, I think, unless she also worked at the baths. The Kingsway cinema was opened in July 1915, occupying the site of some similar cottages to the ones next to it. The cinema was modernised in 1935 (about 18 months after the owning company had opened the Tudor)and it closed on the 12th March 1960. It was demolished a few months later. In its early (silent film) days a number of concerts used to be held there, and in later years talent contests were held; and yes, Eric Bartholomew did appear there. In some people’s opinion it was the best of the three cinemas; it certainly had the biggest screen (40 feet wide). It is understood that a considerable amount of money was spent converting it to CinemaScope in October 1954, and eventually the banks foreclosed. The Lighthouse Pavilion opened on Thursday 31st August 1911 (after several delays) as a venue for pierrot troupes and ‘Concert Parties’. It was quite basic when first built (due to shortage of money) but was improved in 1920 when it became a cinema. After two years the lighthouse, which had served as the entrance, was demolished and a new entrance from Alderley Road was built. It reopened as the Winter Gardens in 1923, reverting to live entertainment. It was probably named Winter Gardens because the then owner was also operating the Winter Gardens, Waterloo, Liverpool, on a similar basis at the time. It changed hands and switched between films and live shows several times in the twenties and early thirties before settling down to be a permanent cinema in 1931. It became part of a large cinema circuit in 1940, which itself was taken over by the Essoldo circuit in 1954 but the cinema continued to be called Winter Gardens. It closed in January 1959 but reopened in May 1960, after the Kingsway had closed and also after Entertainments Tax had been abolished. It nearly closed again nine months later but was saved by a petition of 700 signatures. Essoldo was taken over by Classic cinemas in 1972 and a year later, after a much-needed modernisation, the cinema was renamed Classic. Attempts to change it to a bingo hall in 1973 and again in 1975 were fought off, by me. The Classic circuit was taken over by Cannon Cinemas c. 1982 and shortly afterwards the cinema was remamed Cannon. They disposed of it in 1990 to Mrs. Mottram, of Caldy, who renamed it Hoylake Cinema and ran it for a futher five years, until 2nd March 1995. It lay empty for another four years (during which time it changed hands twice) before being demolished to make way for Sandpiper Court. The lady who worked at the cinema and also at the station kiosk was Mrs. Annie Moore (who was always known by the cinema staff as ‘Nicky’). She had worked at the cinema in the 1930s, returned in 1963 and retired finally in 1981. She had a sister Edna who worked at the cinema and possibly also at the kiosk, but by no means for as long in either case. They had a brother, Albert Marchbank, who was once a doorman at the cinema and later started a taxi business which operated from the station kiosk, which no dobut is why the sisters worked there. I have stacks of information about the cinemas if anyone is interested. Fascinating history Charles. I remember way back- in the days when our parents were friends and we were childre- that you were very interested in all matters pertaining to cinemas. You might remember that my family lived next door but one to the Winter Gardens. I recall the twice weekly film delivery in metal canisters. My bedroom was on the front of the house and the clanking of these containers would wake me up on I think Thrusday and Monday mornings. Yes, I remember your parents, yourself, your brothers and your home – Sandtoft Hotel – very well and with affection. I have often wondered where you all got to. My mother died in 1992 and it then took us two years to sell 18 King’s Gap, not helped by the fact the deeds had disappeared. We eventually sold it for £80,000 and were glad. About four years later, it and the adjoining house each went for £250,000 for redevelopment…. It saddens me that several buildings in Hoylake which I held dear – my home, the Winter Gardens and Broomfield, where our wedding reception was held, have all gone; also the Stanley Hotel and the swimmming baths. All my educational establishments still stand, though some of these I hold in less esteem ! You are dead right about the film deliveries to the Winter Gardens. Monday and Thursday were the film change days and the films might arrive at any time during the previous night. They were delivered by a company called Film Transport Specialists who had keys to all the cinemas. As a young boy I remember the weekly notice with Winter Gardens’ film times that I think you used to put on the tree in a garden in The King’s Gap where Sandbanks retirement complex is now. It was very useful! Did you live in Curzon Road ? If so, I remember you. Yes, I used to advertise the Winter Gardens with hand-painted posters (painted every Sunday evening, after evensong at St. Hildeburgh’s)displayed outside the house. Curiously it was my father who suggested it, which on reflection is most odd because he was a very straight-laced Liverpool solicitor and a stickler for form, and I would have imagined he thought it would lower the tone ! Through the good offices of Alf Smith, the milkman, who knew the cinema manager Mr. Shalless, I was granted at age 10 a permanent free pass to the cinema for my efforts. As a result of this I got to know the projectionist and the rest, as they say, is history. After spending some years in engineering I took over my first cinema, in Yorkshire, and now have four in Yorkshire and two in Cumbria. I would have dearly loved to have the Winter Gardens and did in fact make several attempts to buy it. At the time of its demise my money was committed to cinema projects elsewhere, though I did put in an offer and it annoyed me greatly to discover, later, that it had been sold for development for the same price as I had offered. Thereafter the developers wanted that much more to sell it on. Ah well…. Charles. Yes, that’s right Our family lived in Curzon Road. And you have reminded me of Alf, the Express Dairies’ milkman, with his electric milk float. He was an institution in the locality. Anyone else have any memories? Keith the postman was another long standing local institution, he used to bring letters addressed to a previous home a decade or more later.Not sure the Royal Mail would manage that now. Interested and very sorry to hear of your efforts to buy the Winter Gardens and that you now have a string of cinemas across the north! It was wonderful as a kid to be able to stroll to the cinema, not sure we would ever have gone if it had meant going to Birkenhead or Liverpool. Reading your memories reminded me that in 1987 you wrote the history of Hoylake’s cinema, then a Canon, to celebrate 75 years of entertainment’. I found it on my bookshelf and it has some super pictures. In the final sentance you express the hope that ‘another chapter can be written on its 100th birthday’. Sadly this was not to be….. When did it finally close by the way? I go back a bit further than you and just remember John Smith, Alf’s father, when he was still involved in the farm which, I think, was called New Hall Farm and was along the road which is the first right turn off the road through the level crossing at the station. Originally they sold the milk from their own cows but were so browbeaten by ‘the system’ that eventually they pitched in with Wirral Milk, supplying their milk to them and getting milk from them, bottled. They had a horse called Kitty who used to pull the milk cart (on which we children were given rides sometimes). It was a much more satisfactory way of delivering the milk, because Kitty used to know exactly where to stop and when to move on, and Alf and his son Cyril just used to take the milk from the cart and deliver it to the houses. Postman Keith took over the round in about 1958 / 1959. I think he was also a live-in caretaker at a house in Stanley Road. He would always bring the post into the house, opening the door and calling ‘Morning Post’. I don’t know how long he continued, but he was still there in 1968 to my certain knowledge. A postman in another area of Hoylake, who was also a ‘character’, was Ken Dowden. A few weeks after I wrote the ‘Cannon 75 years’ booklet I received a letter from the Isle of Wight, from Ken Wolsey, son of Frank Wolsey who created the Lighthouse Pavilion. From him I got a lot more information about the building’s early days, plus a number of photographs. Other information and pictures have turned up over the years and only recently I have been studying the Hoylake and Meols Free Press (1915 – 1929) of which I was unaware when I did the original research. I would now be in a position to produce a much more comprehensive and accurate account of the building, but I fear there would be very little interest in it nowadays. To answer your question, it closed on the 2nd March 1995 (just fifteen years ago) with ‘Black Beauty’. Albert also ran the Marchbank funeral services somewhere behind the quadrant, where the coal sidings used to be. Yes he did. He had a ‘Chapel of Rest’ which was in Charles Road, or somewhere at the back of the row of shops in Albert Road. His office was actually the shop at the corner of Lake Place and Market Street. That is the far corner, going towards Meols. Or was it not quite the corner shop but the one next to it, going further down Lake Place ? I’m trying to remember when Albert died. He officiated at the funeral of one of my uncles in 1980, but I have no pointers after that. “The Beacon” parish mag for Hoylake August 1984 has “A&N Marchbank, Hoyle Bank Funeral Home, School Lane Hoylake, – Office: 31A Market Street” By this time the Co-op were proprietors. The School lane chapel was my mum’s school (she was born 1909) and in 1998 was also her chapel of repose. My classmate Marjorie from the Parade School worked there and I dealt with her for the funeral arrangements. Albert’s daughter Ann has emigrated but has attended The Parade Reunions. Albert did my wedding cars in 1970 and was proud to boast that he did most people’s births, marriages and deaths, and also supplied them with a bike in between! In the early days he helped out at Sammy Cattel’s cycle stores. I think Albert Marchbank had been apprenticed to Sammy Cattel and he was certainly still working there in the early 1960s. He also was a part-time gardener (for Miss Whinery at 26 King’s Gap, among others) and was doorman at the Winter Gardens 1960 – 1962/3. It was about that time when he started the taxi business, which later developed to include the funeral service. He and his family lived in Sea View, I think, and his daughter began her working life as a hairdresser. which and when was the last movie shown at the winter gardens ( alderley road hoylake) and thedate it cloased. The last film was Black Beauty and the last performance was Thursday 2nd March 1995. Is Syd Bird, whose is the photo at the top of the page, the same Syd Bird who used to live in Chapel Road and who, in the 1960s, used to give illustrated talks on old Hoylake with his girlfriend Shirley Ledsom ? If so, I would like to get in touch ! Also, the photo is pre-August 1960, because the building to the left is the Kingsway cinema whose demolition began at that time. The building in the second photo does resemble the original (due to the similar placing of the windows, but I can assure you it was a brand new building (which originally opened as the Fine Fare supermarket c. 1961) as the Kingsway was completely demolished. Does anyone have any pictures of the Kingsway ? I have one or two, but deeply regret not accepting my father’s offer to photograph it when it closed. I live in what was hoose court,, can anybody give me any old information on it please as I just love the history of places, especially where I live. Concerning the postmen of yesteryear! I remember one called Keith- not sure if it’s the same keith that you remember. He was married to Stella and lived in the Alderley Road/Evans Road area. Definitely remember Ken Dowden as he is related to my ex husband- and last I heard (3 or 4 years ago) was still alive and living in West Kirby. Charles. Most interesting to hear of the Smith family’s link with New Hall Farm. I think I only remember our milk coming from Express Dairies in the electric milk float. I remember seeing it broken down in Stanley Road, near Field House,with Alf lying down peering underneath! In fact I never knew him except as ‘Alf’ so couldn’t have told you he was a Smith. Is there still a Smith at New Hall Farm I wonder? The farm at Caldy Cross Roads was always known as Smith’s Farm so maybe a link there too? Keith the postie was certainly still going until the late 70s and I think into the 80s? He also cut the very extensive lawns at The Chase in Barton Road. Before that the gardener there was I think called Bert and he rode a bike and lived over the lines. 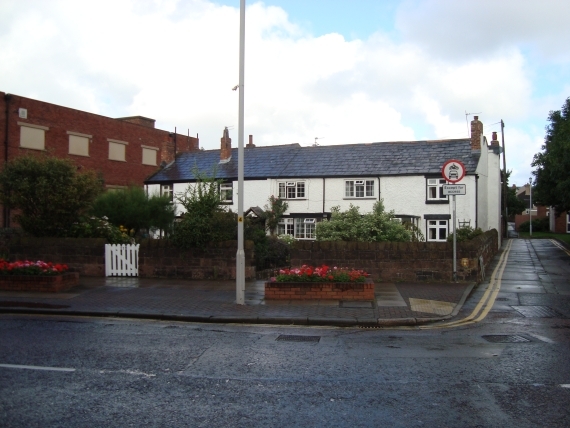 The Chase, one of Hoylake’s oldest surviving houses, unfortunastely was replaced with a small estate of ‘executive detached residences’in the 1980s. Going back to the cinema it seems tragic that it survived against all the odds until 1995 and foundered just as cinema was undergoing a huge revival. What a tragic loss. There may not, as you say, be a huge demand for an updated book on the Winter Gardens but perhaps a wider book on the history of cinema in Hoylake would be a real contribution to recording the history of Hoylake. If you don’t write it, it’ll never be written and it could be published on the internet at zero cost….! Just a thought! Ah yes,of course, Scott’s not Smith’s! I lived and grew up 8 houses down from the cinema, and would love another history booklet on the cinema. I wish someone would write one about the Outdoor Pool. Between the Cinema and the pool is were I seem to have spent my growing up and have wonderful happy memeories of doing so. Hoylake is no longer the twon I remember spending such happy days. I believe when the pool and then the cinema went they ripped the heart and character out, along with of course The Stanley, Kings Gap, the wrought Iron outside the Meatball, etc. I have the record of events from 1976 to 1981 of the Hoylake Pool and Community Trust if anyone would like to see them. I’d be interested in seeing those please Jackie; I’m presuming you are Jackie Hall who was secretary of the fund raising in the early 70’s and onwards? If you come to Melrose Hall I can show them to you. I am there Mon 10 to 12 Tues 10to12 Fri 2-4 most weeks. Thank you for such a great read,i would have loved to have been a child/teen in the days when the cinemas and the pools on the Wirral were a busy and “the place to be”. I do remember going to New Brighton pool when i was younger, even the New Palace was fantastic back then. I would defiantly like to know more about the history of the cinema and indeed the swimming baths also. My father was born at No1 Garden Cottages Hoose (Hoylake) in 1888. Has anyone got a photograph of these old row of cottages on Market street? They were still there in the 1950s. are you referring to the cottages pictured at the beginning of this set of comments and located on the corner of School Lane and Market Street. Many years ago there was a similar row of cottages on the site of were the Kingsway Cinema used to be but they were demolished approx 100 years ago. Hi All its lovely reading this thread, where you all have such fond memories of the town. I too was born and raised in Hoylake and you are evoking fond memories of my past with your thoughts and pictures Especially Syd, who appears to have such a great catalogue (do you have them all online somewhere Syd and are you related to Jackie and maybe the Birds who owned the big fishing boat?). I also worked at the pool as an attendant in its first year and also through the winter on its redevelopment, it was such a shame when the council conned all the money raised by Hipo and built a pool in West Kirby instead, with the loss of the Pool, the bandstand, the cinema, etc. the heart was taken from Hoylake. Look forward to more posts. You probalby remember Gary Bird who also worked at the pool in the 1976 Summer season after he ‘left’ the cinema. my “Old Hoylake” photos are not online at present ,I am slowly transferring the images from my photo albums onto my computer. At one time I transferred a few onto a C.D. but never got round to completing the job properly, there are probably a couple of copies circulating somewhere in Hoylake but not with all the photos on. I think at one time all the Birds in Hoylake must have been pretty closely related and in fact my Great Great Grandfather Richard Bird ( born 1796) was a fisherman but then diversified into the ” Carrier” business in 1835 starting off by conveying fish caught by Hoylake fishermen to Liverpool . After that my part of the family moved full time into the Furniture Removal business so any links with the fishing side of the family have disappeared over time and I am not aware of any connection now. to John Cooper, at Holy Trinity Church, Hoose 14 August 1865. Richard Bird’s wife Eliza Griffiths came from Ellesmere in Shropshire. Eliza is buried at Holy Trinity – so why was Richard buried at St Bridget’s, West Kirby ? Was it because his Father and his Brothers were buried there after the 1810 Lifeboat disaster ? I can remember the ladies that took the money in the Winter Gardens also worked at the swimming pool in the summer, in the ladies’ changing rooms. I can remember seeing Gilbert and Sullivan’s Box and Cox there, and, I think, Trial by Jury. It would have been the late 60s. As for the Smiths, the milkmen, they used to live in Queens Road. I can remember that we used to save the crusts for their horses in the days before they bought the float. I seem to remember that the horses disappeared after the winter of 62/63. Given that where I live now, it got down to -25 C, they probably froze to death in the fields. Just before then, I can remember walking down to the farm, to feed the horses and also to see the cows being milked. Edna Williamson (nee Marchbank), who lived in Groveland Avenue, was one who worked at the baths; and at the cinema for a few years. One of her sisters, Annie (known by some as Nicky), worked at the cinema for a lot longer; and also at her brother Albert’s taxi office. But I don’t think she worked at the baths. The Deeside Gilbert and Sullivan Society used to stage their productions at the Winter Gardens in October, and the West Kirby Light Opera Society around April time. Both had to move to the Tudor while the Winter Gatrdens was shut 1959/60. The WKLOS returned to the Winter Gardens in 1962 but the G & S remained at the Tudor until it closed, returning to the Winter Gardens in 1965. They stayed till the mid 1970s, but the WKLOS had defected to New Brighton before then. I have some old programmes which show that the Deeside G & S did Pirates Of Penzance + Cox and Box in 1968; and HMS Pinafore + Trial By Jury in 1963 (and again in 1972). The G & S appears to have started in 1955 (with The Mikado) and, curiously, the WKLOS did the Yeomen of the Guard the following year. I know Cyril Smith, Alf’s son, lived in Queens Road. I always assumed Alf lived at the farm. Albert provided the cars for my wedding in 1963 and was well established by then in that business. In Janaury 1968 he was extremely knid to me- my new baby was admitted to Clatterbridge as an emergency- she was in for 2 weeks. One day I went to visit- by bus- and was told I could take her home but only in a heated car. I phoned Albert who came to fetch us to go home to Meols. He had the car lovely and warm for my tiny, sick baby. I was very embarrassed and had to tell him that I hadn’t the money to pay him until my husband got paid- he was lovely about it and said it was his pleasure to be bringing us home and he was just pleased my baby had made a good recovery. Albert was a hard worker and a popular man . Elsie married Ted Sherlock,had 1 daughter Susan who married Bob Jenkins,still lives in Hoylake. Mag married Alf Silcock,lived in Carr Lane for over 60 years,eldest daughter Betty married Arthur Cooper still lives in Hoylake in George Road. Edna married Jack Williams,lived in Groveland Ave,worked at Whylies Laundry then at baths.Had 2 daughters Audrey and Barbara who married Vince Voller lives in Meols. Doll married Julian Triggs,worked at Whylies Laundry and the Winter Gardens.Husband Julian killed 15th July 1943 while serveing in the Merchant Navy.Had 2 son Albert Julian Triggs. Albert best known for his taxi and funeral business.Many comments made so will not add more.After his death on 19th October 1981 aged 65 his wife Nellis sold the business and joined their daughter Ann who had emigrated to New Zealand. George Marchbank married Merle Edwards from Wrexham in 1955,has 3 sons,Peter who lives in Manchester.Simon and his wife Claire live in Northampton with their 2 sons Huw and Owain.Pul lives with his wife Heather in Portsmouth with their 2 daughters Koren and Kathryn.I completed my education at Hoyle Road School,serviced in both Merchant and Royal Navy then completed my carreer desisning electronic equipment.Took early retirement in 1992 then spent all holidays cruising the world.Unfortunatly my wife Merle passed away while on holiday in Spain to celebrate our 56th wedding anniversary. Thanks for the info, that explains a lot ! Your mother Anne worked at the Winter Gardens from about 1928 until sometime in the 1930s. She returned in 1963 and stayed till 1981, finishing at the same time as the then manager, Bill Goodwin, retired. Edna worked at the Winter Gardens from about 1962 till 1967 or 1968. Dolly also worked there, as you say. This was not in my time (1961 onwards) but I think it may have been in the 30s or 40s. I intend to revise my history of the cinema, as I said before. In the meantime if you would like a copy of the one I wrote in 1987 you can have one with pleasure. I think you can probably email this site with your address and if they will forward it to me I will post one out to you. Yes, thanks George, sad indeed to hear about Julian’s death in the year I was born. I think I knew your mother “Nick” as she was a good friend of my Aunt Gladys Griffiths nee Armitage, married to my Uncle Eddie. She used to come round to our house to watch TV in the 1950s, jumped out of her witts when a big spider ran over the arm of the arm chair in which she was sitting! I am also in touch with Martin S who assisted in the projection booth (both Hoylake Cinemas). I remember him saying they used 100 amp carbons in 50 amp arc projectors, explained why the picture was often flickered! And i did mention elsewhere that I once saw the rectifier at the Kindsway, full of mercury, I hope it was disposed of correctly. I also attended the Christmas parties at the Wints, I am sure the manager had a white mop on his head as a wig! Finally, I do have a copy of the Silver Screens book, hoping for decent part exchange rates for the new one! I would be most grateful if you could put me in touch with Martin S, so that I can pick his brains about his cinema experiences. who emigrated to New Zealand. My mother was briefly friends with the family and Ann (Regina ?) is roughly the same age as me (born 1944). My son is travelling through New Zealand on holiday and thought he might look her up. Do you have an email address for her, or know anyone who might have one. Have so enjoyed reading all these memories of the cinemas and the swimming pool. I can recall visiting these cottages as a lad in the early 1960’s. In fact my father Craig built the porch on the front on either the cottage on the corner of school lane or the next one in. My grandmother’s (Fanny Green nee Sutton, Rainford) sister Katherine Groom (nee Rainford) lived there at the time. I did hear it mentioned that the cottage had been in the family for many years but like most family stories I doubt if it is true. HI ANDREW YOUR FATHER, MY BROTHER CRAIG,BUILT THE PORCH ON THE CORNER COTTAGE. AUNTY KAYS NAME WAS KATHLEEN McCARD NEE RAINFORD.MY GT GT GRANDMA CROXTON LIVED THERE THEN MY GT GRANDPA AND GRANDMA ROSS THEN MY GT UNCLE LEN AND AUNTY CISSIE ROSSLIVED THERE THEN MY UNCLE JACK AND AUNTY KAY McCARD BOUGHT THE COTTAGE FROM MIS FRANCIS. AND ALSO LIVED THER FOR MANY YEARS ,SO I THINK WE CAN SAFELY SAY THE FAMILY “DID”OCCUPY THE COTTAGE FOR VERY MANY YEARS, DON,T YOU? Of course, it was Aunty Kay McCard. Got my relatives all mixed up. I never knew the history of the cottage so I can now add this to my every growing knowledge of family events in the past. Some interesting comments about Smiths and farms. My mum’s maiden name was Smith and my 3 x great grandfather John Smith farmed at what was called Carr Farm in Moreton. Does anyone know if this was specifically the site where the Carr Farm nurseries is, along the Meols stretch? Or was Carr Farm just a general term for the whole area? Jim O’Neil has anew book out – Hoylake: Then and Now and one of its photos has a young lad John Smith with horse and cart, outside the John Smith Dairy in Wood Street/Market Street. Is this the John Smith you’re referring to? The author reckons the photo is around WWI but I’ve no idea what period of time the John Smith you’re referring to is. He’s only a young man in it so it’s possible he is. If it’s the same guy, does anyone know what his parentage was? I’m not aware my 3 x great grandfather John Smith did any dairy farming but it’s possible a descendant did, especially as the book refers to the Carr area as being the source of the milk. Apparently the man in the cart was George Beamer. By the by, my great grandfather was Herbert Smith who married Elizabeth Ann Barton, a local midwife. Bit of a stretch, I know, as she died 1952 but did anyone know of her, have any stories? She also ran the chippy in West Kirby by the mock Tudor houses. The ‘ Hoylake ‘ Smiths ran a Dairy Farm down Carr Lane Hoylake , next to the Municipal Golf club . Some of the family live locally , with one son still farming on Wirral . I remember the postman well FRED BANKS (dec) used to terrify me as a child, Lovely KEITH EDGE and wife STELLA , KEN DOWDEN and wife CATH , The lovely FRANK SILCOCK(dec) amd my Dad JOE MADDOCKS (dec) They were happy days, I think for the postmen too. I am sure there are many more but these are the ones I knew from my childhood I would have been 10 in 1959.